Things We Say Today And Owe To Shakespeare : The Two-Way A Tumblr post from an English lit geek has gone viral and you'd be surprised how much we owe Shakespeare. A 20-year-old girl named Becky from London posted a picture of one of the pages of her Moleskine notebook on Tumblr. It has, as they say, gone viral and less than a week later is making waves across the Internet. 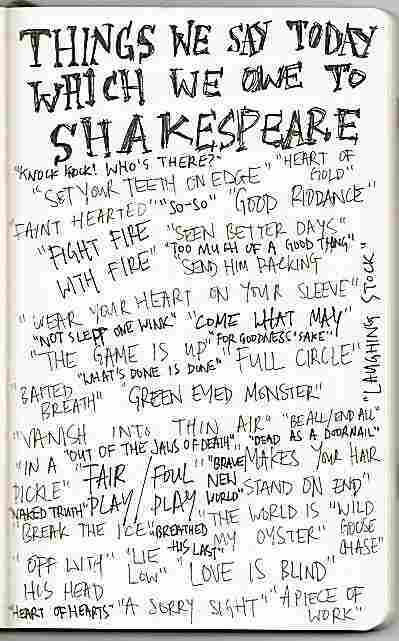 It's a simple thing: Becky wrote down, the "things we say today which we owe to Shakespeare." It's phrases like "send him packing," "makes your hair stand on end," and "lie low." Click over to Becky's Tumblr blog to see it full size. We agree with the English Muse blog, which tipped us off to the post, that it is "awesome." Update an Sept. 16, 2011 at 10:44 a.m. How Shakespearean Are You? Reader, J Connolly, points to a wonderful tool from Oxford Press. It's a "How Shakespearean are you?" meter. In it you copy and paste some text into the tool, then "your words will be compared with all the words used by Shakespeare in his plays and our verdict will be delivered on its Shakespearean content." We ran this post through the tool and it said we were 75 percent Shakespearean. "A hit, a very palpable hit!" it said. Oh, and one more note: We heard from Tina, of the English Muse blog, who added a bit of context to this whole thing. "The fact that Becky's list went viral shows that people still love books and literature," Tina said in the comments.